Born and raised in Vancouver Canada, Christina studied kinesiology at UBC before moving to Australia to complete her Masters of Physiotherapy at the University of Sydney in 2008. After graduating she gained experience working in private practice as well as on the field with local sports teams. She was also introduced to the Pilates Method and completed her instructor training with Polestar Pilates Australia. Christina loves the combination of physiotherapy and Pilates, and believes it not only helps to restore optimal movement and efficiency, but also improves quality of life. Christina’s classes cater for all skill levels from beginner to advanced and addresses specific rehabilitation goals as well as providing a whole body workout. 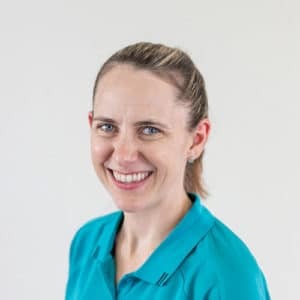 In recent times, she has continued to expand her knowledge in physiotherapy and is proficient in dry needling, ConnectTherapyTM, and Muscle Energy. Christina has a special interest and formal training in Women’s Health, especially pre and post natal pelvic floor muscle training, prolapse, urinary incontinence and pain disorders. She has recently trained in both craniosacral therapy and visceral manipulation, both of which are a great addition to her holistic approach. In her spare time Christina enjoys running, swimming, weight training, pilates, yoga and of course spending quality time with family and friends. Christina works part-time. She is available for Physiotherapy treatment and Women’s Health appointments on Monday all day and Thursday afternoons. She also teaches PEP sessions on Tuesday and Thursday mornings.